You’ve landed on this page after clicking on a link from the Canal & River Trust web site. I’ll let you know how you can get your free guide in a minute but first let me tell you who I am and why I’m giving away a free guide. My name is Paul Smith. I live on my own narrowboat, James. I’ve lived on board now for the last three years and, I can quite honestly say, I’ve loved every minute of it. I moved onto my current home as a knee-jerk reaction to a failed business which resulted in a failed marriage and general unhappiness all round. I needed somewhere to live and, because my finances where in a dismal state, I needed that somewhere to be cheap. I moved onto a boat not because I wanted to experience the lifestyle, but because I needed somewhere cheap to live. I made the common mistake of thinking that boats are far cheaper to live in than bricks and mortar homes. Oh boy, was I in for a surprise. Anyway, here I am three and a half years later. My floating home is still the same boat I moved onto but it’s very different now than when I first stepped on board on 2nd April 2010. 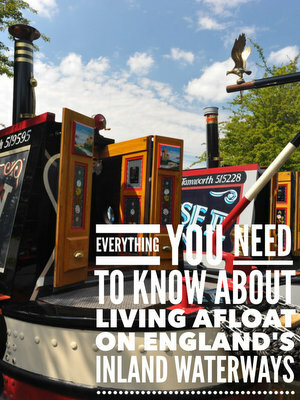 I didn’t know the first thing about narrowboats then. I made a few mistakes. I would have made many more costly mistakes if I hadn’t been living and working at a marina surrounded by very experienced narrowboat fitters, engineers and fellow liveaboards. During my first few months as I was finding my feet and learning all about the very different – and very exciting – life afloat I regularly turned to the internet to look for answers to the bewildering array of subjects which baffled me. There were, and still are, some excellent resources online but even after hundreds of lonely hours hunched over my aging laptop I couldn’t find comprehensive answers. As a hobby I created this site and, because I’m a bit obsessive, I spent literally thousands of hours researching topics and adding them to the site. The result, I’m proud to say, is one of the most popular narrowboat blogs in the country with a lively forum. I’ve taken dozens of articles from the site, including many by guest authors, and added them to an eBook. I’ve also added links to all of the regular newsletters I’ve written over the last two years and also added links to the most popular forum posts and threads. It’s the most comprehensive free guide to life afloat you’ll find anywhere, on or off line. Partly because I know how much I struggled when I first moved on board. I was actually very fortunate but more by luck than management. My boat is 36 years old. There was a lot wrong with it when I first moved on boards. The repairs have cost me a fortune. But this boat is fundamentally a very good boat. It will last me for as long as I want to stay afloat. I don’t want you to make the mistakes I’ve made because the chances are you won’t be so lucky. I said that I was giving the book away partly to help you avoid the mistakes I made. It’s true but, in the spirit of total transparency, let me tell you the other reason. I’ve written a couple of books; Living On A Narrowboat: The REAL Cost Of A Life Afloat and Living On A Narrowboat: 21 Liveaboard Case Studies. I’ve also developed a browser based software application which enables potential narrowboat owners to quickly and easily calculate the cost of owning their own boats, whether they intend to use them as full time homes or just for recreational cruising. At the end of the free eBook, there are links to these paid products. Maybe, just maybe you will be interested in investing in them once you have read the 180 pages of information in the book. There you are. My secret’s out! I’ll tell you another secret. Half of the income I receive from these products is donated to the Canal & River Trust to help them maintain the waterways which have brought me so much pleasure. It’s a win-win situation. The Trust give their visitors added value by pointing them in the direction of a very useful free resource, and receive much needed donations from me to help with their charity work, I receive a little income to help me maintain the site and you save yourself days or even weeks trawling the internet looking for elusive answers. Your free guide is just a click away. I hope you find it useful.